Even the movie poster is stunning. 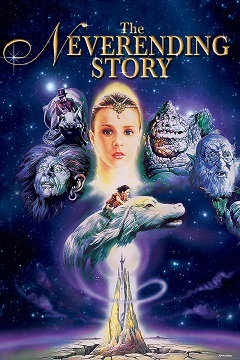 I embarked on a quest to watch through Tor’s list of 80s Fantasy. I haven’t seen many of those flicks, so I figured I’d watch through. 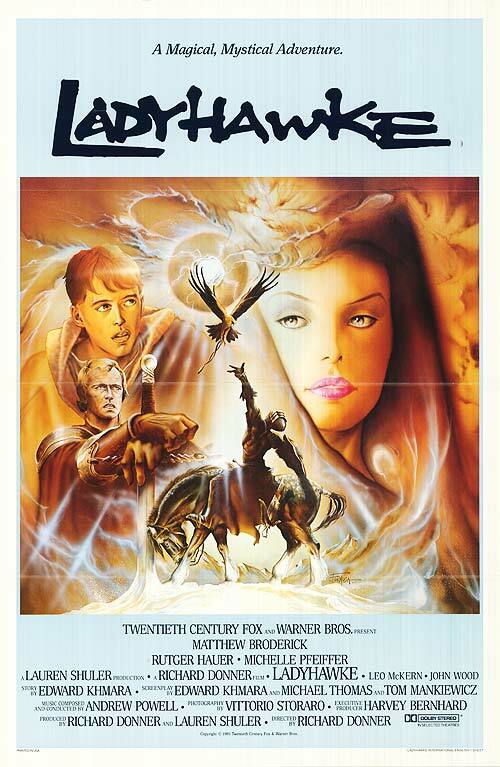 Next up is “Ladyhawke,” yet another one I’ve never seen before–to my embarassment! There will be SPOILERS in what follows. “Ladyhawke” is, at its most basic level, the story of a curse. Two men–a corrupt bishop and Etienne of Navarre, the Captain of the Guard–fall in love with a woman–Isabeau d’Anjou; one is rejected and decides to curse her for spurning him. Thus cursed, the woman is a hawk by day, and the man a wolf by night. Fearing endless torment, the man decides to kill the one who has put them in this condition, and thus begins a quest which leads to the curse being broken at last. But “Ladyhawke” is way more than that. It’s got true love, adventure, escape, fighting, revenge…okay I’m not talking about “The Princess Bride,” but this is a fantastic movie. Basically everything goes right. Seriously. But let’s get this out of the way–the thing that goes “wrong” is the music. It’s not terrible, but it’s almost 100% 80s synth-rock. I’m sure it seemed like a great idea at the time, but it has not stood the test of time very well. With that out of the way, let’s explore what went right. First, the movie is stunningly filmed. The angles in each shot are just awesome, often with characters silhouetted against beautiful landscapes or sunsets. Second, the story itself is compelling and epic. It’s a true fantasy, and it feels like a fairy tale that I never knew about [it apparently is one, by the way]. Third, the characters are endearing and extraordinarily well-acted, particularly Mouse–the cutpurse comedian who dialogues with God throughout the movie–played by Matthew Broderick. Fourth, you get the idea–go watch the movie! The humor from “Mouse” was sustained throughout, but there were a number of truly epic one-liners that just had me laughing with glee. I don’t want to reproduce them here both because they really should be watched and because some of them are only humorous contextually. I could see this becoming a movie I start to memorize and use lines from, though. The story itself holds up remarkably well, for as simply as you can write it out. Again, this is largely due to the strength of the characters. Etienne is clearly distressed by the cursed condition and is driven to vengeance while Isabeau holds out hope. Mouse deftly inflames their love even more. Something about the curse itself seems simultaneously sad and awesome. If only they could morph into those animals at will rather than having it tear their love apart. Seriously, this movie was amazing. I immediately purchased it (having gotten it from the library). “Ladyhawke” is a tremendous film.